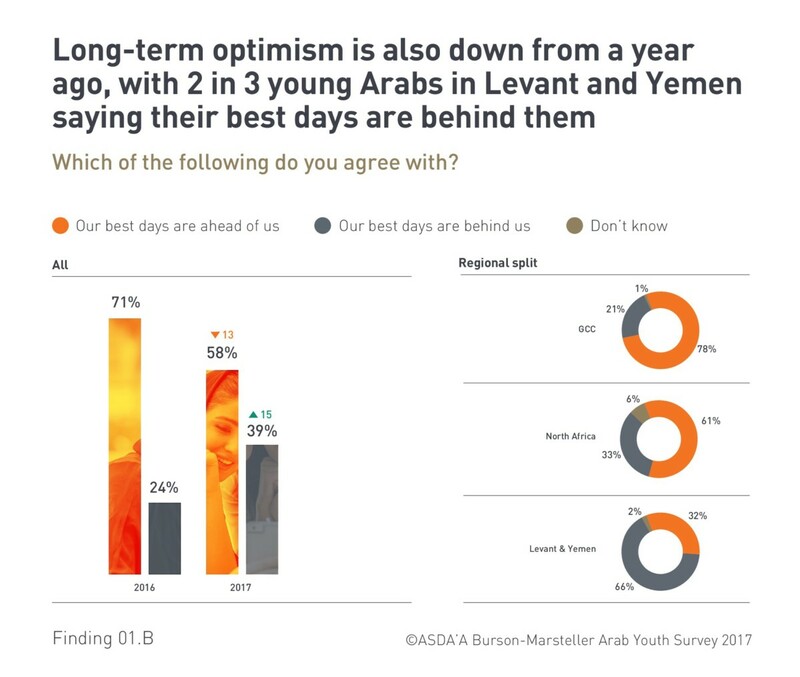 Tarek Chemaly: ASDA'A Burson-Marsteller Arab Youth Survey: The ticking is the bomb. 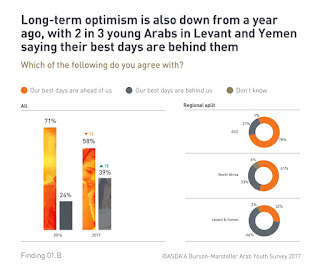 ASDA'A Burson-Marsteller Arab Youth Survey: The ticking is the bomb. 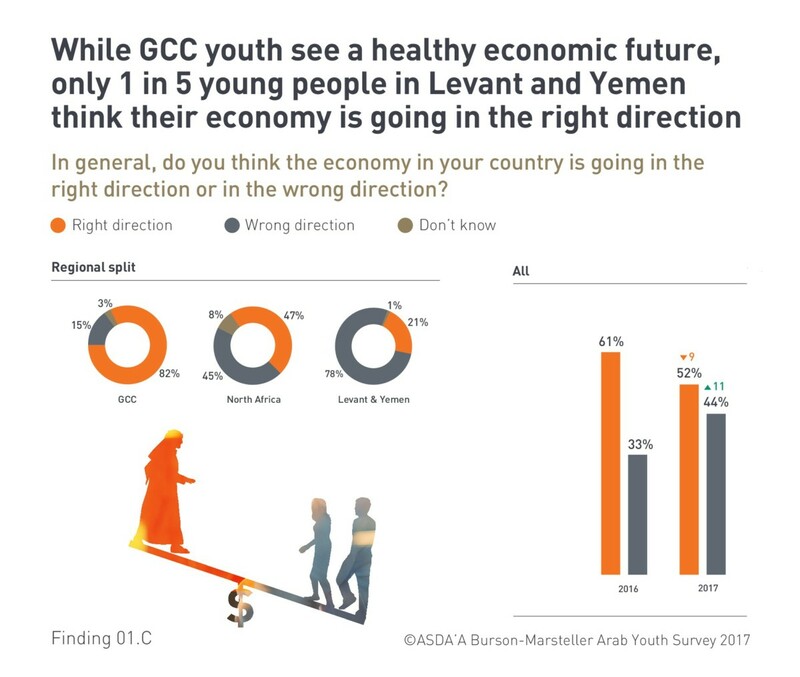 The 9th ASDA'A Burson-Marsteller Arab Youth Survey is here. 3500 face to face interviews conducted, of a sample of 18-24 aged Arab youth, with a 50/50 gender split, coming from 16 different countries (Bahrain, Kuwait, Oman, Qatar, Saudi Arabia, United Arab Emirates, Iraq, Jordan, Lebanon, Palestinian territories, Yemen, Algeria, Egypt, Libya, Morocco, and Tunisia). With 60% of the Arab population under the age of 30, and over one-third of them, more than 100 million, aged 15 to 29, this Survey presents evidence-based insights into the attitudes of Arab youth, providing public and private sector organisations with data and analysis to inform their decision-making and policy creation. 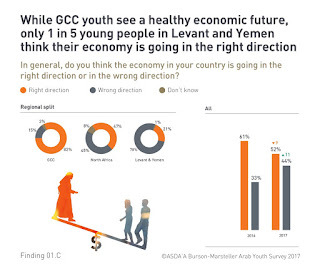 1 - Optimism among young Arabs is waning, with a clear split by geography into "haves" and "have nots". 2 - Young Arabs want their countries to do more for them and feel overlooked by policymakers. 3 - Young Arabs view unemployment and extremism as the biggest problems holding the Middle East back. 4 - Many young Arabs say their education system falls short of preparing students for the jobs of the future. 5 - Daesh has become weaker during the last year. 6 - The UAE sprints ahead of the pack as the country young Arabs wish to live in and want their own countries to emulate. 7 - Young Arabs say Donald Trump is anti-Muslim and express concern, fear, and anger about his presidency. 8 - Anti-American views are on the rise and now Russia, not the US, is seen as the region's top ally. 9 - Despite their pride in Arabic language, most young Arabs admit to using English more in their daily lives. 10 - Among young Arabs Facebook is the number one medium for daily news. General Charles De Gaulle said "ca va sans dire mais ca va mieux en le disant" (it goes without saying, but it goes better saying it), in essence the ASDA'A Burson-Marsteller basically puts into figures (and words!) what many people know intuitively. I am by no means dismissing the survey, on the contrary if I titled this post "the ticking is the bomb" after American author Nick Flynn's book (where incidentally I am mentioned!) it is because for a long time I said that the devil works with idle hands. The more the educational system fails to prepare the youth, the higher the unemployment (and no, working as someone's kafil (guarantor) and earning money out of it does not replace having a job), and with the youth having more and more time to kill it is much easier to put radical ideas into their minds and therefore make them more extreme as they spend their time on social media being an easy prey for manipulative minds. For all our problems in Lebanon, and God knows we have an incredible number of them, the educational system at least, with a multilingual basis and an exposure to science, arts and many other topics, seems to at least give the local youth a small edge (that one of our biggest exports is university-degree holders testifies to that ironically! ), but then again, I suppose we in Lebanon are inventive enough to have other means to radicalize those youth anyhow. The ticking is the bomb indeed, let us work on diffusing it.